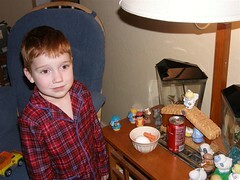 C & N chose to leave Santa a hard boiled egg (he needs protein for energy, you know! ), carrots for the reindeer, and Daddy talked them into leaving a Coke instead of the hot tea with milk they wanted to leave. C was a very tired boy by the time we put out the snack!